OTTAWA — The federal government is still expecting NAFTA talks to accelerate this summer even though U.S. President Donald Trump says he's in no rush to sign a deal until after the U.S. midterm elections this fall. A government official familiar with the plan says now that Mexico's presidential election is done, Ottawa wants to restart talks as soon as possible, even though Trump says he won't sign a new deal until after U.S. voters go to the polls in November. "Our priority has always been to conclude a mutually beneficial agreement as quickly as possible and that, I think, remains our goal," said the official, speaking on condition of anonymity about a matter they weren't authorized to discuss publicly. "That's what we're going to stay focused on. We'll see where it goes." On Sunday, Ottawa responded to the Trump administration's tariffs on Canadian steel and aluminum with duties of its own against U.S. imports. The Trudeau government has described Canada's retaliation as dollar-for-dollar, reciprocal tariffs that target steel, aluminum as well as a long list of consumer goods. Until Lopez Obrador is sworn in, members of the current Mexican administration will continue to serve as the country's lead NAFTA negotiators, the official said. On Monday, Prime Minister Justin Trudeau spoke with Lopez Obrador by phone. The two discussed "mutually beneficial economic and trading relationship between the two countries, and their shared priority of updating the North American Free Trade Agreement for the betterment of their peoples," Trudeau's office said in a statement. In an interview that aired Sunday on Fox News, Trump said he could quickly sign a revised NAFTA with Canada and Mexico, but instead wants to land a better deal for the U.S. Asked about the timing of an agreement, Trump said: "I want to wait until after the election." On Ottawa's tariffs on U.S. goods, White House spokeswoman Sarah Sanders said Monday that it does nothing to help Canada and only hurts American workers. "We've been very nice to Canada for many years and they've taken advantage of that, particularly advantage of our farmers," she said. In recent months, Trump has frequently attacked Canadian trade barriers on agriculture with a particular focus on dairy. He's insisted they've hurt American farmers. In the Fox News interview, Trump said he proposed to his G7 partners at last month's summit in Quebec that they remove all trade-related barriers and taxes. "Canada, you're not going to get 275 per cent for your dairy and you're going to take down all your barriers," Trump said as an example. 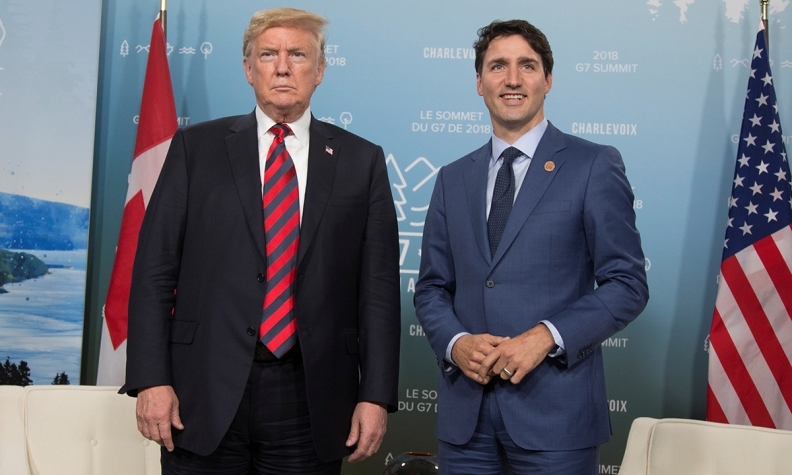 Trudeau has insisted the U.S. president's complaints about Canada's trade barriers are the result of his refusal to give in to Trump's demands to do away with the country's supply-managed system that protects dairy, poultry and eggs farmers. The prime minister has said they've disagreed over Trump's call for Canada to open up its supply management system during NAFTA talks.